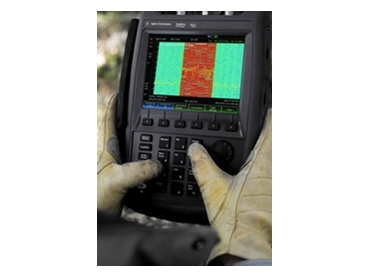 Agilent Technologies has introduced an interference analyser option for its popular FieldFox RF Analysers, an integrated RF handheld for wireless installation and maintenance (I&M). Agilent have also introduced new spectrum analyser features. FieldFox's speed, 1.5 updates per second, is fast in the commonly used 20 MHz span and the 3 kHz resolution bandwidth (RBW). The analysers offer a dynamic range in spectrum analyser mode (96 dB) and fast sweep times for interference detection with resolution bandwidths under 30 kHz. Using the spectrogram and waterfall display, Agilent's new FieldFox interference analyser option includes quick, easy detection and monitoring of intermittent interference signals in the field. the ability to easily play AM/FM audio via speaker or headset, which is especially useful in identifying and demodulating modulated signals. FieldFox integrates six key I&M measurements into one unit with test times that are more than 50 percent faster than traditional testers. Key measurements include: cable and antenna test; spectrum, interference and vector network analysis; true average power measurements; and a vector voltmeter. Agilent's FieldFox RF handheld with an integrated QuickCal capability is used to calibrate the instrument without a calibration kit, providing worry-free accuracy and repeatability. A CalReady feature delivers immediate calibration, ensuring the unit is calibration ready at the test port immediately following power-up. The Agilent FieldFox handheld RF analyser, product number N9912A with the new interference analyser, Option 236, is available now.